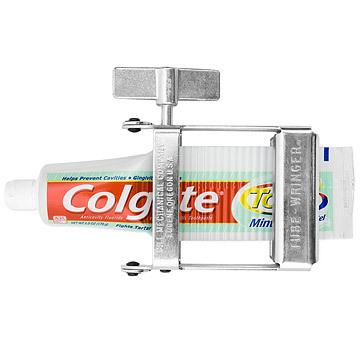 With the Tube-Wringer, squeezing out that last drop of toothpaste is a cinch. Squeeze up to 35% more out of your household supplies with this forearm and time-saving device designed to make tubes good to the last drop. Squeezing out the last bit of toothpaste can be an unwelcome, time-consuming endeavor, especially when you're running late--ditching even milligrams of pricey paste can feel wasteful. But, with the Tube-Wringer®, squeezing out that last drop is a cinch, literally. Just secure the tube between the aluminum rollers and turn the steel handle to compress. It's simple, sturdy and effective. Ideal for everyday use. Made in the USA. Ideal for arts and crafts, oil paints, caulk, adhesives, medical compounds, toothpaste tubes, ointments, and more! I use it at least daily and for tubes other than toothpaste. This thing is so cool. Gets the last squeezes of toothpaste and sunscreen out, and makes the tubes easier to store. I am using to get every drop possible from both oil and watercolor tubes. Love it!! I purchased this for my boyfriend as he's the kind of person where everything has a place. i.e trays for everything. I thought it would be 1. Smaller and 2. something he could leave on his tooth paste so it'd look more attractive sitting on the counter. It's neither of these things. Thankfully when you need to push your paste up it works fabulous and he did get a kick out of the idea. Would buy this for all my friends! I bought this as a stocking stuffer for my sister-in-law and my whole family went crazy for it! It was the sleeper hit of Christmas gifts. We spent a chunk of time Christmas finding all sorts of tubes to test this out with. It did amazing on the toothpaste in particular, leaving a crinkle in it that kept the toothpaste from flowing back. I ended up ordering one for my dad, an engineer, because he was so impressed with its usefulness. Perfect gadget for my boyfriend! My dad is so hard to shop for, but this really made him laugh and he loves it. It works like a charm too on a variety of tubes. I had a tube of face wash that I could tell still had a lot left, but because of the consistency it was hard to squeeze it all out starting from the bottom. I saw this and knew it was exactly what I needed. Works wonderfully. I think it has pushed 95% or more of the face wash to the tip and I know it will work great with toothpaste too! Highly recommend it!